Where does this leave Wheel clamping companies, in relation to the angle grinder and hack saw? There is a defence to criminal damage, if you believe that you did it in self help. So, if you think it is illegal, chop it off. Do the least amount of damage though, cut the padlock, as this is the cheapest thing to replace. And, as said, they have to prove who did the damage. There is ways of taking off clamps without damaging them, either by picking the lock, or undoing some suspension bolts. if you went for a coffee, presumably you went to McDonalds. Did you not park in the small car park adjacent to the "restaurant"? Sounds like you parked in the spaces for the retail outlets. Sanchez, claim you just bought the car from a geezer in the carpark (he drove in, you drove out). Honestly, these ticket people are a little bit dodgy. 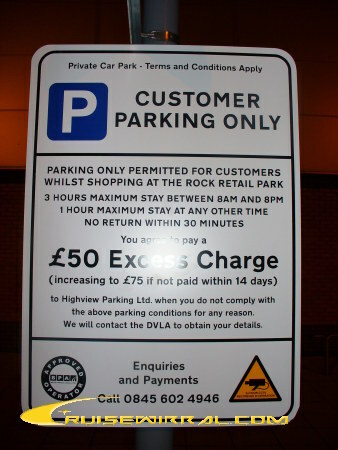 Only condition I could see was that you were limited to 3hours parking between the hours of 8AM and 8PM, no where did it mention night time parking, and I would take it that like most other car parks, conditions were dropped outside of the hours stated. Also, states that its a �50 fine unless not paid within 14days, when it then goes to a �75 fine. I would say it was an infringement on human rights to shop at a leisurely pace, especially if you were buying a computer and were swapping from Staples to PC world trying to get the best deal. You may be rushed into buying something you didnt really want at a price more than you were willing to pay because you didnt have time to think it over properly. Unless they have changed the signs since they put them up last year, there is a 1 hour restriction at other times. 1. You say you arrived at 10:30, they say you left at Midnight, during that time are you SURE you didn't leave then return an hour later for another drink... that complies with all their terms and conditions, maybe they missed you on the film, could they check it, and send you a copy so you can have it independently verified ? 2. What is "Parking" ? Park - verb (used with object) - to place or leave (a vehicle) in a certain place for a period of time. Did you place it, did you leave it, did you use the drive-through and stay in the car, did you drive aimlessly round the carpark for all that time, as they only have two cameras on a single pole, one pointing as you come in, one as you leave (went down tonight to check) how can they PROVE what you did ? To Park has a definition, did you park, and can they prove it. Ignore it, they can't do ANYTHING to you without going to court, they can't register a debt against you, because there isn't one, they can't send anybody to collect the money, because they need a court order for that. They will send you a form asking for the drivers details, and it is the DRIVER they have to claim against, not the owner or keeper, and if they don't know, they can't file a claim (okay they can, but it will fail). If the police send a request for driver details you have to respond, there is no such rule for private companies, so unless you admit it and say "Oh yes it was me, but.. <insert excuse>" then nothing will happen. doing and charging is wrong. I believe that whilst it is the driver that is responsible for most moving offences, the registered keeper is responsible for the unattended situations. If the police send a request for driver details, you do have to respond BUT you don't have to sign the document which prevents it being used in court. In this case as you rightly say, you don't have to respond to the private company, however they get the keeper details from DVLA. I noticed the sign wasn't lit at night, I wondered if it has to be, also I was wondering what happens if your car breaks down whilst your in there. The idea about driving around for your entire stay is a good one too. My car did break down once when i was in there.. i had to leave it there haha! very true bill, i remember that car very well, what a pain in the arse it was! Not too good, I worked on the rock a few years back, scandallas they can do this, is one small sign really enough? thery should have a big massive one as u drive in and reminder ones one islands. When I went there last night I seem to recall that there was more than one sign, but you're right it's not very big and if you stop to read it carefully (as I did) no-one can get past you. Looking through the internet I noticed the same company caused uproar in Hull go to > http://www.thisishullandeastriding....ines/article-1553829-detail/article.html . Seems shoppers got together and boycotted the shops etc and all refused to pay the fines. Imagine if no-one used their car to shop there . . . I am pretty sure the shops would get involved and help then. How do I do the thing when people say Click Here to do a link. Last edited by dizdazdoz; 10th May 2010 12:03am. I think the parking time limitations are to stop commuters leaving their cars all day while travelling to to Liverpool or Chester from Green Lane station. From that point of view, fair enough, but issuing tickets for midnight parking is ludicrous. Been thinking about this and I reckon you should just ignore the ticket. Last edited by MikeT; 10th May 2010 12:39am.